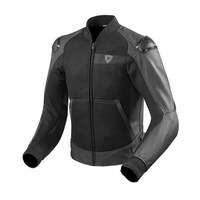 Like the Blake, the Blake Air speaks to a new segment of motorcycle clothing. The crossover between a sportive jacket and an urban ready jacket for the streets is evident in the use of our MotoGP developed dual comp shoulder protectors and the knitted cuffs and collar. By using highly abrasion Monaco Performance cowhide on the high impact risk zones and 3D air mesh on the less vulnerable parts of the jacket, we have created a strong summer jacket that hits the mark when it comes to today’s trends in the motorcycle industry. SEEFLEX™ CE-level 2 armor underlines the performance aspect of the Blake Air, which is upgradable by installing our SEESOFT™ CE-level 2 back protector. The detachable body warmer is perfect for riders who get off to an early start in colder morning temperatures, and it is easily removable once the sun comes out and temperatures rise. Please Note: We can ship REV’IT! products to US, US territory or APO/FPO addresses only (per manufacturer’s restrictions). $25 Promotional Gift Card available on this product! Our fit check process involves trying real products on our size check mannequins. We’re in the process of doing that and will report here as soon as we’re done.